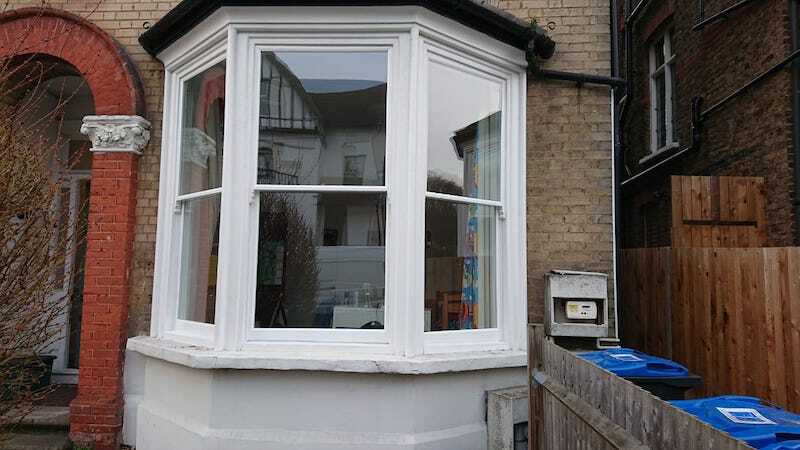 In this case study we replaced the sash windows making use of the original frame. We manufactured the double glazed sash like for like, making them look as close as possible to the original single glazed style. The objective of this install was to improve the heat loss and reduce noise. The frames themselves were in good condition but there was a fair amount of movement that meant the sashes needed shooting in and matching to fit. the overall result was excellent and the noise reduction significantly noticeable. As the winter sets in the heat and thermal efficiency will be appreciated too. 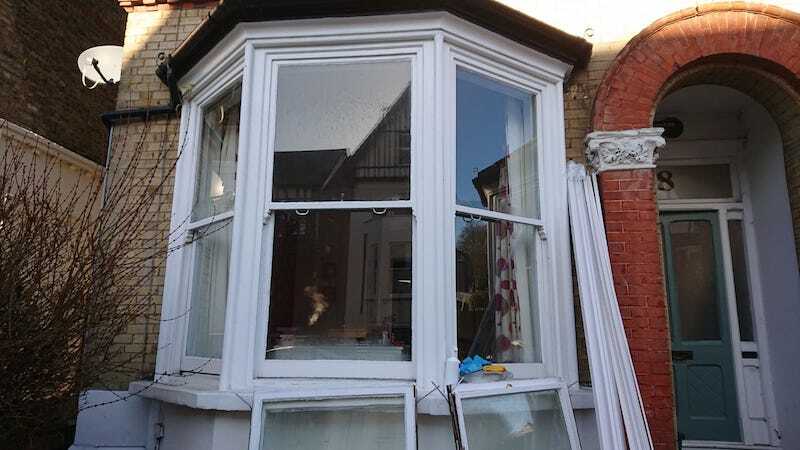 We will take a look at how we installed this double glazed bay sash windows. Before we get into the actual process, here’s a look at the original bay windows prior to install. Sash window bay before we installed double glazed sash. The first part of the job is to lay dust sheets through the house and around the bay windows. 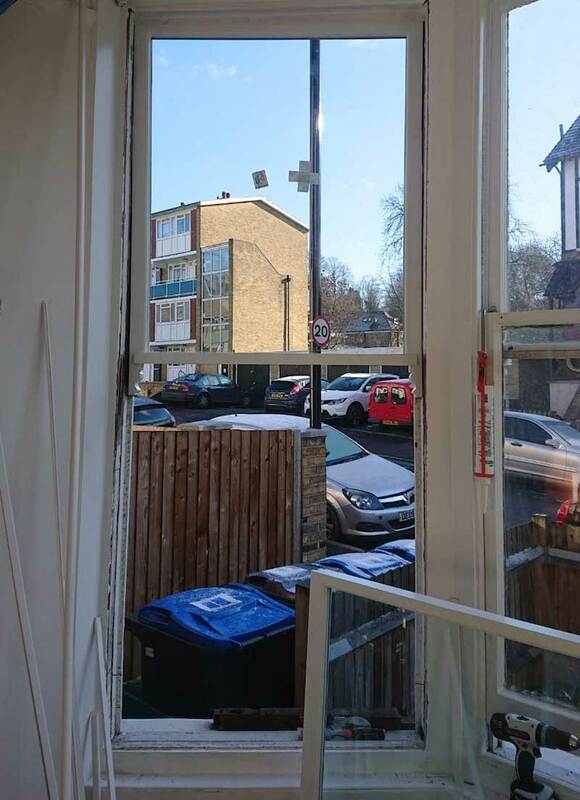 We then measure our windows against the original frame to ensure they fit, occasionally issues occur so it’s always better to be safe than sorry. In this case the windows fit within 3mm. The movement was accounted for very well by our surveyor who measured to compensate for the frames having movement. Don’t let movement put you off either, it’s perfectly normal to have movement in Victorian properties, using the original frames saves huge amounts of money too. 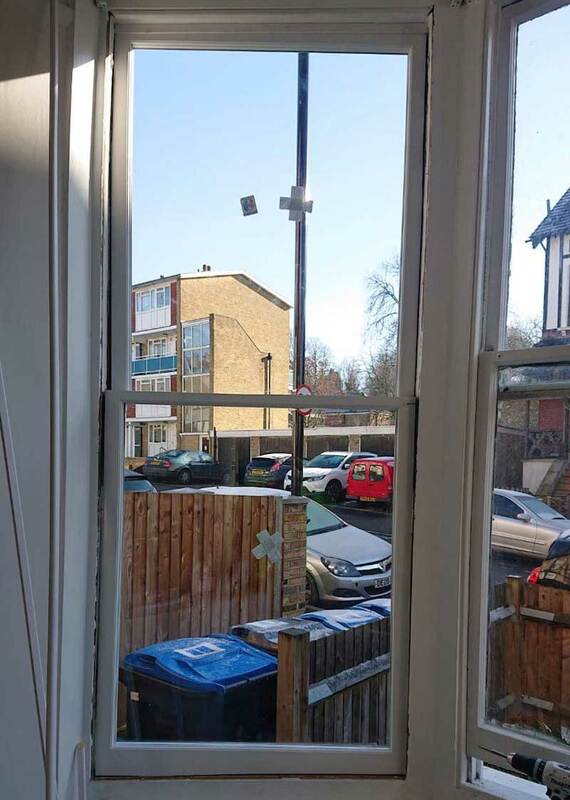 A complete replacement bay window will set you back in the region of £8000, whereas using the original frame can cost as little as £3000, a very attractive saving considering the thermal and acoustic properties are very similar to entire replacement sash windows. Here’s a full list of our sash window prices. Firstly the staff bead is removed that holds the lower sash in place, from here, we remove the lower sash. This is normally screwed in if it was a fixed sash and needs careful removal. If the sash was functioning then it’ll be a simple case of cutting the cords and simply lifting the lower sash out. Here’s a look at the window dismantled. This exposes the parting bead. The parting bead is rebated into the original frame and needs carefully prizing out. It is normally pinned in place too with 40mm panel pins. If decorated correctly we also need to break the paint seal. It’s best to do this with a utility knife to avoid too much cracked paint. Once parting bead is removed the next stage is to remove the upper sash, much in the same way as the lower sash. It’s possible the top sash is painted in too so this will be gently removed. The frame will then need scraping down and priming. In this example we fixed the side windows to reduce the cost of the mechanism and only have the lower middle functioning. That help keep the price of a double glazed bay sash window under £3000. That’s a seriously good investment given the size of the windows and the reduction in costs. Double glazed sash window machined to fit the original frame. With the middle sash there’s more process and mechanism. The lower sash is functioning so it required weights and cords. The weights and sash counterbalance each other so it’s imperative that they are within a pound or two of each other in weight. If the sash is heavier than the weights it’ll simply slip down, if the weights are far too heavy you’ll be able to lift the lower sash incredibly easily but pulling it down will be heavy because you are working against the additional weight. The top sash is fitted in the same was as the fixed double glazed sash windows with parting bead installed. The lower half has a draught proofing system as it’s functional. The sash cord is threaded through the pulleys and then a weight tied on. This rope is then attached to the weight and the sash attached to the cord and offered into the frame. Staff bead is then fitted with a brush pile running through it. We then install furniture and catches to finish the window off. The sashes look very nice, the paint is a spray system that bonds really well to timber and lasts ten years. We guarantee double glazed sash windows installed into the original frame for five years. As you can see there’s very little difference in look between single glazed and our like for like double glazed sash is very minimal. You can normally tell a window is double glazed by the reflection of the two panes of glass. The glazing bead is also a little larger but not very noticeable.